Siberian Bear replied to El Presidente's topic in Cigars Discussion Forum "the water hole"
That's exactly what I thought when smoked my first Entretiempos! Reminds me of a fresh Cohiba, not as refined of course but some notes such as grass and a little sweetness are very similar. Siberian Bear posted a topic in Cigars Discussion Forum "the water hole"
This is probably 9th or 10th one from the box I got sometime ago from 24:24, all so far been good. Punched and checked the draw - perfect amount of resistance. Pre-light flavor is mainly mild tobacco. First third - takes off with mild body and creamy coffee flavors. Maybe a little grass here and there. Creaminess reminded me of a CoSho I smoked after couple of weeks of non-smoking due to a flu. Usually CoSho is not creamy to me but that time was quite unusual but very pleasant. Second third - more body at this point, keeping coffee flavors but cream is gone, replaced by sweet and grassy notes. Last third - solid medium body, darker coffee, grassy sweetness became light honey, hints of bready/yeasty flavors, quite nice finish for this little fella. 89 points due to some funky burn I had to fix with my torch couple of times, though previous ones from this box were about 90-92 on flavor + perfect razor sharp burn. Smoking time was 55 min. Your fingers look very oily and ready to smoke in light of this photo filter! Nice tint of rosado too! PL Panetela UTE MAY 16, very tasty! Mininum Humidity Before Cigar Damage? Siberian Bear replied to RickHendeson's topic in Cigars Discussion Forum "the water hole"
0% with 451F ambient, damaged for good! Which is the best of the Fatty Half Corona Format. I love all three and have 4 boxes of each, however, 4 more boxes of RyJ PR are on the way, since it has this amplified cherry flavor that I've been looking for in many different RyJ vitolas. 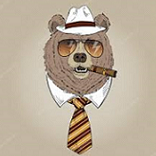 Siberian Bear replied to leafdream54's topic in Cigars Discussion Forum "the water hole"
Thank you for this review! This happens to be one of my favorite fresh smokes, I get cherry flavors all the way, which I can't say the same for other RyJ sticks of similar age. Siberian Bear replied to nKostyan's topic in Cigars Discussion Forum "the water hole"